Trevor and Linda are at their wits end with their rebellious son Jason and his lifestyle of raves, booze and ecstasy tablets, so they stage his funeral, convinced that when faced with his own mortality, he will mend his ways. Aunt Angela and Uncle Derek join in the charade but soon voices are raised and too much alcohol is drunk and the whole scenario descends into chaos. 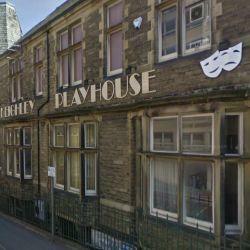 The Keighley Playhouse is within easy walking distance from the Keighley Bus Station and the Keighley Rail Station.